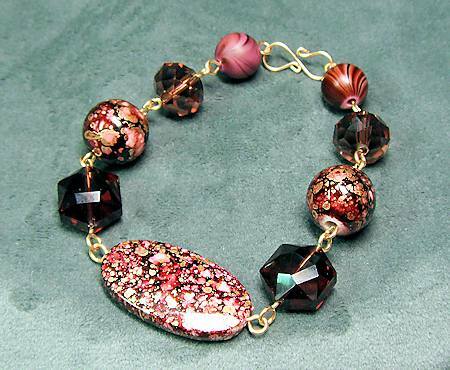 This is a video tutorial on how to make a simple loops bracelet with beads. It’s a quick and easy project, and it’s also a lot of fun! Simple loops are circular loops made around a pair of pliers which aren’t wrapped; this means you can open and close them easily. They are great for earrings, necklaces and (of course) bracelets! There are some things you need to know about beforehand, though, so read on through this page before getting started. In the tutorial, you will see that I made the simple loops bracelet using dead soft 20 gauge wire in red brass. It’s an inexpensive wire, and it’s relatively stiff, which makes it great for learning and for fun jewelry. You can also use copper, regular brass or artistic wire to practice your simple loops. However, if you are using sterling or gold-filled wire, I would suggest either using half-hard in 20 gauge, or move up in thickness to 18 gauge. This is because since the loops aren’t wrapped, they could loosen if you are rough with your bracelets (like me, LOL). If you can’t locate half-hard wire, you can work-harden it yourself by running a length of wire through a cloth, your fingers or a pair of nylon-jawed pliers. Run the wire through your cloth/fingers/pliers at least 7 times to make it harder. I hope you enjoy watching how to make simple loops, and using them to make a bracelet. Remember to check out my project page, as well as some more tutorials below. Have fun!